In Central Texas, tree care professionals have a debate on their hands: is ball moss harmful to trees or not? While some believe the latter, the truth is, ball moss in large quantities can have a negative impact because it shades out young buds and leaves. And as it grows in surface area, it can lead to a variety of issues like limb breakage (not to mention that it also happens to be unattractive). So, if you’re dealing with ball moss on oak trees, what are you to do? First things first…what is ball moss, anyway? Ironically, it’s not a moss at all, but a proper plant that flowers and seeds. This rather unsightly bromeliad commonly grows as an epiphyte (non-parasitic plant that lives on other plants), much like lichens, orchids and ferns. It absorbs water and nutrients from the atmosphere and only serves to steal space and light from the tree. The exposed roots that hold the plant to a branch are actually “pseudo-roots” that don’t absorb water or nutrients at all. This insidious invader thrives on interior branches that receive limited light, and the tree promptly discards these tainted limbs. Many who witness these dying branches insist that ball moss was involved in their death. Can their demise be prevented? Is there a type of ball moss treatment that can get rid of this eyesore before it spreads? Most everyone can agree that ball moss on oak trees is ugly. 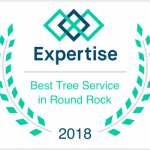 The difference between a stunning live oak, cedar elm or crape myrtle infested with ball moss and one without it is so striking that most people immediately call up a Central Texas tree care expert. Here’s why that’s a wise decision. Improper pruning of ball moss can be harmful to your tree. In fact, unskilled tree trimming is the cause responsible for the decline of many trees. 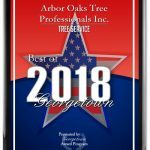 Professional pruning demolishes deadwood and opens the outer canopy to remove most ball moss on oak trees, and deter the growth of new plants. In most cases, the plant only has to be removed once, but when humidity is high or airflow is low, more may return. You have two options when it comes to ball moss treatment: manual removal or chemical sprays. If you notice ball moss on oak trees, you’d be wise to leave treatment to the experts. The beauty and shade that your lovely oaks provide not only increases the enjoyment of your property, but also boosts you home value. Professional ball moss treatment will take them to new heights.